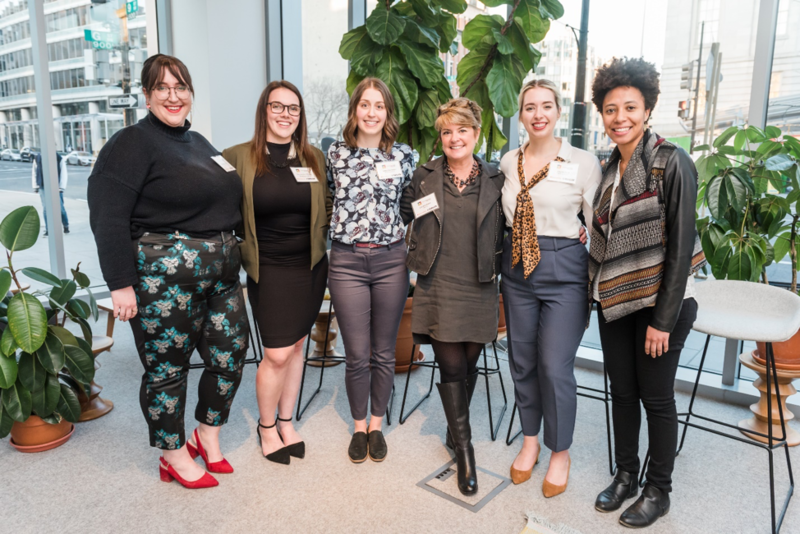 Work Design’s inaugural Emerging Talent event drew a standing-room-only crowd to Herman Miller’s Washington, DC showroom on Tuesday, March 19. We were very excited about the interest there was in the event and the crowd was not disappointed. While we feature the work of many established architects and interior designers – with so much focus on the design of workspace for emerging talent, we decided to investigate what was happening in our own industry. We teamed up with Lisa Brockman, A&D Strategist at Bialek, a Herman Miller dealer in the Washington, DC area. Over the past three years, Lisa has developed and implemented a professional development program for those just entering the design community. Bialek’s NextGen program, created with a team of industry experts is a series of seminars covering skills that will help participants learn and grow into leadership positions as they gain experience in their practice. Topics include many subjects key to developing a design career, such as communication and presentation skills, business etiquette and career guidance and practical topics such as “Furniture 101”. Our five panelists were selected from the 100 participants in the program to date. WDM’s emerging talent (l/r), Maddie Frost, Fox Architects; Samantha Mason, Perkins + Will; Sam Geraci, OTJ Architects; Lisa Brockman, Bialek (Moderator); Lauren Funk, Leo A. Daly; Karyn Wilson, IA Interior Architects. The panel worked through a series of questions designed to shed light on how they (and their peers) view the challenges and rewards of working in their respective firms. First up was the question about debunking “the millennial myth”. Collectively, the panel defied the stereotype(s) that millennials are potentially lazy and waste all their money on avocado toast! While the comment got laughs, the reality is that millennials work just as hard, do have a strong desire for success, and do appreciate structure and feedback. Our inaugural Emerging Talent event drew a full house. The panelists comments pointed out that they and their millennial colleagues appreciate feedback, for example, but expect that it is constructive and helpful in letting them move forward and learn. Pointing out that they have a different perspective, based on their age and experience but have every expectation that they can enthusiastically meet the challenges and demands of the profession. Moving on to the next topic of the technology enabled workplace the panel discussed how use of technology informs their practice. One panelist noted that their generation has grown up with technology and has bridged the time between simple technology (flip phone) and advanced technology (smart phone). All expressed that technology is moving so fast that they are forced to grow and manage the technology as it changes and the new technologies of today will perhaps be obsolete as they navigate their careers. One comment on Revit, gave pause for thought – it may become out of mode at some point as new programs are developed to replace it. Lisa noted that each generation drives technology and the tools of today are surely to change as more technology such as VR and AI are integrated into design practice. Noting that today things move faster, and time does not slow down, the panel was asked about their thoughts on how they manage the stress of today’s work environment. They discussed how the “Amazon effect” and influence of HGTV and Pinterest have created clients with more interest and engagement in design affects their work. Each panelist reflected on how they manage this aspect of their work and interact with their teams and managers to work through the bumpier parts of design practice. The discussion was lively, and informative. One of the more interesting topics was how mistakes and failure are managed in the panelist’s respective firms. Each response noted that working through mistakes and failure was one of the most positive learning experiences in their practice. The variety of opportunities to examine what works and what doesn’t, “lessons learned” and open discussion among team members of all levels of responsibility, is one of the most effective ways to nurture and educate newer members of the firm. Exposure to other teams and projects in firm wide discussions offers the opportunity to learn and grow outside their own project bubble. Providing a safe environment to discuss these issues was one of the most valuable things the panelists appreciate about their individual work environments. After the conversation was opened to questions from the audience, the panelists were able to expand on some of their earlier comments and some interesting techniques they use in managing their work. Tips ranged from making a playlist for each project, to making a note when you come up with a great idea in the middle of the night, to more importantly, don’t be afraid to take risks. It’s ok to make mistakes and as Lisa noted innovation is often driven by failure. It was invigorating to see the passion and enthusiasm of today’s emerging talent panel. The conversation continued well into the evening. A special thank you to our supporting brands: Bialek, Herman Miller, Framery, Mohawk Group, DWR Contract, Avitecture, Geiger, KTA, NOS, and IIDA. All images are © Erin Kelleher Photography.